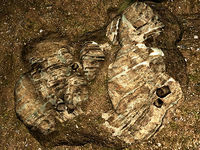 Large amounts of silver can be found in Markarth, both in the mine and in various homes and businesses in the city itself. Two silver weapons are available in the game (Silver Swords and Silver Greatswords), which do extra damage to undead, including werewolves and vampires. You cannot forge these silver weapons; the only way to obtain them is by looting from Silver Hand members and lairs. 3 Silver Ores are obtained by mining Silver Ore Veins. Can be purchased at level >=3. 1 Silver Ingot is obtained by smelting 2 Silver Ores. Silver Ore may be sold by blacksmiths and general goods merchants starting at level 3. 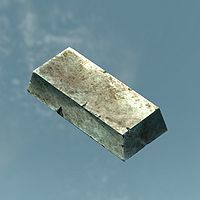 Silver Ingots may be sold by Moth gro-Bagol at all levels. 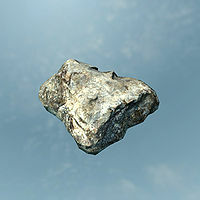 Silver Ore can also be created by transmuting Iron Ore (and can in turn be transmuted into Gold Ore). There are a total of 95 veins, 30 ores, and 119 ingots available in the game. Only notable locations are included in the following list, including places where large amount of the mineral may be found and places that are particularly easy to access. The Silver Veins category contains a more complete list of places containing single veins. All exterior ore veins are shown on (map). Note, however, that only 50 veins are shown on the map at one time; to see the rest of the veins, click on "Next" at the bottom of the list of results. The Reach Sanuarach Mine 7 4 2 Nearby Fenn's Gulch Mine also has one vein; multiple ores and ingots are also found in adjacent Karthwasten. Markarth Cidhna Mine 6 4 To access the silver veins you must be on the quest No One Escapes Cidhna Mine; just being a regular prisoner in the jail gives no access to ore.
Whiterun Hold Lund's Hut 12 As part of the Stormcloak quest Compelling Tribute, you ambush a wagon along the road 740 ft north of Lund's Hut (map). This wagon is carrying a chest containing 12 Silver Ingots. Solitude Solitude Blacksmith 8 6 ingots inside and 2 outside. Silver items can be forged from the start of the game, without the need to unlock any Smithing perks. The gemstones not listed here can instead be used to create Gold jewelry. Note that although your in-game inventory shows the weight of a ring as 0.3, the true weight is 0.25. Therefore the two Silver Rings crafted out of one Silver Ingot have the exact same weight and value as the Silver Necklace that could instead be crafted. 1 Silver Ingot is needed for the quest The Only Cure. Silver weapons cannot be improved at grindstones. This page was last modified on 29 December 2014, at 20:50.